Prime Minister Harris is seen with some of the walkers at the start of a previous PLP/PM’s Health Walk at Belle Vue bus stop in Constituency No. 7. Exhausted walkers are served breakfast at Ottley’s hard courts after a previous PLP/PM’s Health Walk. Prime Minister Harris (right) is seen cheering those still arriving. BASSETERRE, St. Kitts – Health-conscious walk enthusiasts are being reminded that the latest edition of the Peoples Labour Party/Prime Minister’s Health Walk will be held Saturday, April 28. 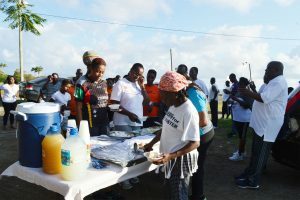 According to Peoples Labour Party (PLP) National Secretary Myrtilla Williams, the walk will be held in Constituency No. 7. The usual route takes the walkers along the Island Main Road from the bus stop at Belle Vue through the various picturesque Constituency No. 7 villages of Tabernacle, Mansion, Christchurch, Bourryeau, Lodge and Lodge Project, and ends at Ottley’s hard courts. 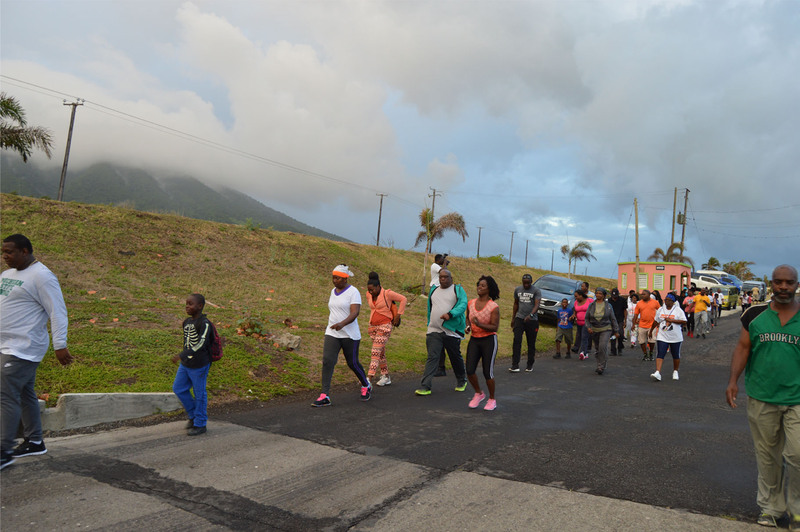 Prime Minister Harris, who is also CARICOM’s lead spokesperson on human resources, health and HIV matters, has been taking the matter of healthy lifestyles seriously and has shown it by the example of having started monthly health walks in his constituency more than 10 years ago. The event was known as the Dr. Harris Constituency No. 7 Health Walk. With more walkers turning out from outside Constituency No. 7, the health walk was rebranded last year to give it a national outlook and was renamed the Peoples Labour Party/Prime Minister’s Health Walk.